By MR. T. CECIL SMITH WOOLLEY. Plan of Littleborough by William Stukeley, 1722. Gathered here in this peaceful but remote corner of our county, it is strange to reflect that we are really at one of the more important points of the great Roman Empire, so far, at least, as regards its splendid dependency of Britain. For there is no room to doubt that we stand on the site of the Roman Station of Agelocum or Segelocum. In the great road-book of the Roman Empire-the Itinerary of Antonine- which is supposed to date from the 3rd century, this station occurs twice. Once it is called Agelocum, once Segelocum. In each case the distance is given as 14 miles from Lindum, and 21 from Danum. Allowing for the angle at which Till Bridge Lane adjoins Ermine street, about 31/2 miles from Lincoln, these are almost exactly the actual distances from Littleborough to Lincoln (Lindum) and Doncaster (Danum) respectively. Apart from the Itinerary we have the striking evidence of the Roman milestone found at Lincoln and now preserved in the museum there. Situated on one of the great roads from London to the North, and at the junction of that road with the waterway of the Trent, we might be sure that Agelocum was a place of some importance, even if that fact were not indicated by the second half of its present name, and by the remains found here. The earliest historical reference to the place, at all events under the name of Littleborough (Litelburgh), is in Domesday (1086), where it appears as soc land of the Conqueror. But Harold, on his forced march south in 1066 to the battle of Senlac, and perhaps, William himself a year or two later, travelled from York to Lincoln, and no doubt crossed the river at the ford of Littleborough. I have no reference to the place as a Roman station (except the Itinerary) earlier than Camden's great work (1586-1607.) In the translation of (?) 1806 the writer speaks of Littleborough as "a small town strictly answering to its name," and duly identifies it as the Agelocum or Segelocum of Antonine. He adds "...This I had before sought for in this neighbourhood without success, but am now clear I have found it, both by its situation on the military way, and because an adjoining field shews traces of walls, and daily in ploughing yields innumerable coins of Roman emperors, which, being often turned up by the hogs, are called Swine's Pennies by the country people, who, according to their notions, imagine their forefathers had built a stone wall round that field to keep off the inundations of winter." Thoroton (ed. 1677), so far as Roman remains are concerned, adds nothing to Camden except an excursion into etymology, whjçh my respect for his memory prevents me from quoting. The object of it appears to be to support Camden's earlier and abandoned view that Agelocum was on the river Idle. Hither came Stukeley half a century later (Itinerarium Curiosum, ed. 1724), and, as usual, after reading his report, one wonders whether Archaeology is the richer or the poorer for his wealth, his industry, his wild imaginings, and his credulity. 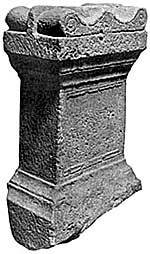 Roman altar found at Littleborough. I quote him with a feeling almost of affection, but also with a conviction that nobody need feel bound to accept any of his statements as "de fide." He writes as follows:-" Littleborough, Agelocum, or, as by later times corrupted, with a sibilus, into Segelocum. This is a small village three miles above Ganesborough, just upon the edge of the water, and in an angle. Agel auk, frons aqae, is a pertinent etymology; it seems only to have been environed with a ditch, and of a square form, and the water ran quite round it; for to the west, where White's bridge is, a watery valley hems it in: so that it was a place sufficiently strong. The church stands upon the highest ground. The Trent has washed away part of the eastern side of the town. Foundations and pavements are visible in the bank. Mr. Roger Gale, passing by, once found an urn there, with a coin of Domitian's: great numbers of coins have been taken up in ploughing and digging: they call them swine-pennies because those creatures sometimes root them up, and the inhabitants take little care to save them. I saw a few there: the reverend Mr. Ella, vicar of Rampton hard by, has collected several, and some valuable ... About forty years ago, when the inclosures between the town and bridge were plowed up, abundance of these coins were found, many intaglias of agate, cornelian, the finest coral-colored urns and pateras, some wrought in basso relievo, the workman's name generally impressed on the inside of the bottom, a discus with an emperor's head embossed. In 1718 they dug up two altars, handsomely moulded, which are set as piers in a wall on the side of the steps that lead from the water-side to the inn: on one is the remnant of an inscription, LIS ARAM DD., these are of the course gritstone. Many very little coins are found here, like flatted pease ; they call them mites. Mr. Hardy has a large urn with the face of a woman on the outside. In this same field near White's bridge are great foundations of building; coins are often found too at the lowest edge of the water, when the tide is gone off..."
We are, I think, on surer ground when we come to the personal observations of Mr. Thompson Watkin, as reported in the Archaeological Journal, vol. xliii. He says that the causey, eighteen feet wide and raised in the bed of the river, probably dating from the reign of the Emperor Hadrian (A.D. 117-138)–for a coin of his was found in a cleft of one of the piles-remained until 1820. It was then removed, I suppose, for the same reason that led to the destruction of the remains of the Roman bridge at Collingham in 1884, viz., to improve the navigation. In 1877 Mr. Watkin obtained the evidence of an old and trusted servant of the Trent Navigation Company, who had himself helped in the work of removal, and who said that the ford was paved with rough square stones. On each side of the road piles ten or twelve feet long were driven into the bed of the river, and pieces of timber ran from one to the other giving support to the whole. The timber was black oak, but soon rotted when exposed to the air. This was not the case with the oak from the bridge at Collingham. Existing specimens, after twenty-five years' exposure, are still quite sound. Mr. Watkin found some traces of the wall and fosse surrounding the station. He mentions that an immense quantity of coins were found in 1736, when the fields between the station and the river were first ploughed. They seem to have ranged from Nero A.D. 54 to Constantine II A.D. 337. One other inscription is recorded in the "Gentleman's Magazine," circa 1772. It was on an oculist's stamp, and was stated to have been found "lately by casting up the ground" in the vicinity of Littleborough. It appears to have been 2¾in. long by about 1¾in. high. The inscription is imperfect and obscure. Probably it has been incorrectly copied. It appears, however, to refer to Stactum and Diapsoricum, which are said to have been medicines for the eyes. Stacta or Stacte is myrrh-oil. It is sad to think of the dispersion and loss of the "immense" finds spoken of by early antiquaries. It may be hoped, however, that the visit of this Society will stimulate local interest and lead to the careful recording and preservation of any coins or other remains of the Roman occupation which may come to light in the future. Passing from the pagan Rome, it must be noted that Littleborough is now accepted by the best authorities as identical with Tiovulfincacester, the scene of the great acts in the conversion of our forefathers to Christianity. Bede, in the 8th century, writing of the great Paulinus's mission in the 7th (less than 200 years after the Roman occupation), says the saint baptized "the multitude in the river Trent hard by the city, which in English is called Tiovulfincacester." It is said that Paulinus and his deacon James travelled southwards from York as far as Lincoln. If he came, as seems most probable, by the great Roman highway, this is the place of his passage of the Trent, and what more likely than that the event which Bede records should have taken place in the shallow waters of this already historic ford? The absence in Domesday of any mention of a church is no evidence that one did not exist at the time of the survey. It is silent as to churches in all the parishes of the Soke of Oswardbeck, of which Littleborough formed part. After listening to the above interesting paper, an adjournment was made to the church, a Norman structure, consisting of a nave and chancel, with a few Early English additions, such as a western doorway. There is a modern vestry in the north side of the nave, and a double bell turret. The chancel arch, with a bold roll-moulding with cushion caps and keyhole ornament, is a choice example of Norman carving; but the original deep-splayed circular-headed windows in the nave have been cut down, and now contain a poor substitute for the originals. This was probably done at the restoration in 1831-2, when Mr. Foijambe restored the chancel and the parishioners the nave, The whole fabric measures only 45 x i5ft. The vicar (the Rev. H. J. Griffin) read a short paper on his church, and showed the visitors the registers, the church plate, and some interesting letters and documents having reference to this ancient locality.